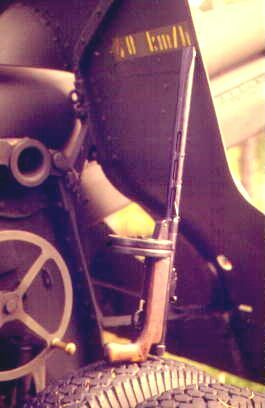 Early version Konepistooli m/31 Suomi with the 50-round box magazine. Picture provided by J. Haartikka. This is my fifth version of the Suomi SMG. If anyone has additions or comments, please let me know. -:Pistole-mitrailleuse "Suomi" - Brevet annouce. Tikkakosken Rauta- ja Puuteollisuus Osakeyhtiö, Helsinki 1931. Huhtala, P.: Reserviupseeri - Reserviupseerien ja -aliupseerien kertaus- ja jatko-opiskelukirja. Werner Söderström Osakeyhtiö, Porvoo 1940. 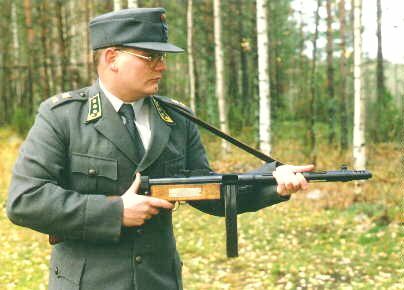 Note: For pictures and detailed history of this weapon, please read the Suomi Submachine Gun, KP/-31 article in the Gunwriters' online magazine. Konepistooli m/31 Suomi "Bunker Model"
Konepistooli m/31 Suomi "Tank Model"
The Konepistooli m/31 Suomi has been the standard sub-machinegun of the Finnish army for more than sixty years. Conscript NCOs were still being taught how to handle the Suomi in the late Eighties, although the gun had been replaced decades earlier as the infantryman's standard automatic weapon by the RK m/62 assault rifle, a copy of the AK-47. Tens of thousands of Suomi SMGs are rumored to be stockpiled by the Finnish army in case a need should arise. Designed by Aimo Lahti, this accurate if heavy SMG is a well-made, elementary blowback weapon. In appearance it is very similar to the German Bergmann MP34 and the Soviet PPD 1934G/38G and PPSh41 which it inspired. The gun is capable of both automatic and semi-automatic fire. When firing full automatic this well-balanced weapon remains very easy to control thanks to its heavy bolt. The Suomi is very reliable even in extreme conditions and its barrel can be speedily changed without special tools. The 1940 Handbook of the Officer of the Reserve states that weapon is at its most effective at a distance of 50 to 300 meters. The bullets are lethal up to 500 meters and more but at those distances the spread of the burst begins to be too wide to ensure hitting the target. The sights were graduated up to 500 meters. During World War II most Finnish troops were armed with bolt-action rifles. During the Winter War of 1939-40 the standard deployment of automatic weapons was two LMGs and two SMGs per platoon. In the Continuation War of 1941-44, the number of SMGs was increased to four per platoon. In the field, however, troops who needed much firepower - such as strike units, bunker-clearing teams and long range patrols - tended to have a very high concentration of SMGs. Suomi SMGs were always issued to the most capable men and used with devastating effect during close combat in the forests. The Late Model Suomi SMG with the 50-round box magazine. Picture by J. Hartikka. The later model Suomi appeared in 1942. Except for the the addition of a muzzle brake and the consequent increase in length and weight, it is identical to the original model. Left: The Bunker Model Suomi. Picture by J. Hartikka. About 500 "Bunker Model" Suomi were commissioned by the army in 1941 for use in trench fortifications. The original Suomi SMG's thick barrel jacket was a liability when defending a bunker; it could not fit through small firing slits and if the gun was kept completely inside the bunker, the shooter was blinded by the muzzle flash and gunsmoke. The special Bunker Model addressed this deficiency with a much longer, slimmer barrel jacket, while the barrel itself remained as originally designed. For additional agility the gun's stock was replaced with a pistol grip. The "Tank Model" Suomi had a pistol grip and a very heavy barrel jacket that could be attached to a six-ton Vickers tank's small weapon mount. Instead of a hull machine gun, the Vickers boasted a sub-machine gun and submachine gunner. When the crew were outside the tank, the SMG could be carried as a personal weapon. In practice the heavier jacket was often kept semi-permanently attached to the tank turret and a standard barrel jacket was attached to the weapon when it was taken outside the tank. Other developments included a standard Suomi SMG attached to a Finnish model 44 flamethrower. With this combination weapon, the flamethrower user could protect himself against enemies out of the 15-meter reach of the flamethrower. The tanks of the flamethrower lasted for 40 to 60 seconds, providing 50 to 60 short flame bursts. A small batch of these weapons was made and tested at the front. The Suomi was tested in 1941 by the US Army as a candidate for M1A1 Thompson SMG successor. This competition was won by the M3 "Grease Gun". Some Suomis were bought by the Swedish, Swiss and Danish armies. The weapon, in a modified form, was made in Sweden as the 37-39, and imported as the 37-39F. In Switzerland they were made by both Hispano-Suiza and the Waffenfabrik in Bern as the Model 43/44. In Denmark the manufacturer was Madsen. Makeshift factories in Stalingrad produced a rough copy of the Suomi, the 7.62 mm KF-42 SMG. 120 Suomis were presented to the German troops of AOK Norwegen in 1942 for use on the Finnish Front. Most of these weapons left Finland with German troops in 1944 and were subsequently used in other theaters of war. The standard magazines during wartime were the 20 and 50-round clips and the 70-round drum. The 50-round clips were somewhat unreliable and prone to cause jamming problems. The drum magazine was copied by the Soviets for their PPSh41 and earlier SMGs. In 1955 Suomis were converted to take the Swedish 36-round box of the Carl Gustaf, and this magazine is still used along with the 70-round drum. The following accessories were issued with the weapon: A spare barrel in a leather pouch, a pouch for carrying clips, a tool pouch, gun cleaning accessories and a leather strap for the gun proper. An early version Suomi SMG stripped. Note the heavy bolt. Picture provided by J. Haartikka.